Starting on the back row, from left to right: William Leland (Big Bubber), Maie Dell, the nurse holding Mary Remer (Dinah), Stella, and Kathleen (for whom I named my daughter). On the front row, left to right: John Young (Little Bubber), Margaret, William (my 2nd great grandfather), Edwina (Midge), and Leona (my grandmother). I love that Uncle John Young is all dressed up sans socks and shoes. I shared a photograph of these children all grown up in my post Wordless Wednesday: Brothers and Sisters. 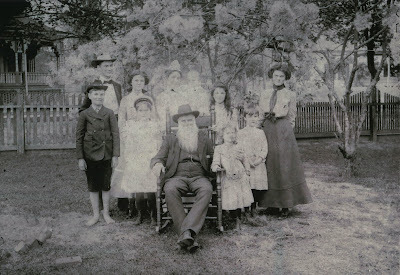 They're also in the photograph behind my blog title, but you can go to my post The J. T. Roberts Family--A Group Photo ca. 1936 to see who's who. Finding this photograph was a wonderful surprise!